Hermione Jean Granger (/hɜːrˈmaɪ.əni/ /ˈɡreɪndʒər/) is a fictional character in J. K. Rowling's Harry Potter series. She first appears in Harry Potter and the Philosopher's Stone, as a new student on her way to Hogwarts. After Harry and Ron save her from a mountain troll in the girls' restroom, she becomes best friends with them and often uses her quick wit, deft recall, and encyclopaedic knowledge to help them in really bad situations. J.K Rowling has stated that Hermione resembles herself as a young girl, with her insecurity and fear of failure. The character has had immense popularity. The version of Hermione portrayed by Emma Watson in all eight Harry Potter films from Philosopher's Stone in 2001 to Deathly Hallows – Part 2 in 2011 was voted the best female film character of all time in a poll conducted amongst Hollywood professionals by The Hollywood Reporter in 2016. Hermione Jean Granger is a Muggle-born, Gryffindor, who becomes best friends with Harry Potter and Ron Weasley. J.K. Rowling states that she was born on 19 September 1979 and she was nearly twelve when she first attended Hogwarts. She is an overachiever who excels academically and is described by J.K Rowling as a "very logical, upright and good" character. J.K. Rowling adds that Hermione's parents, two Muggle dentists, are a bit bemused by their odd daughter but "very proud of her all the same." They are well aware of the wizarding world and have visited Diagon Alley with her. Hermione was originally intended to have a sister, but the planned sibling did not make an appearance in the first Harry Potter novel and, as Rowling noted, it "seemed too late" to introduce the character after all of that. Rowling confirmed in a 2004 interview that Hermione is an only child. Rowling has described the character of Luna Lovegood as the "anti-Hermione" as they are so very different. Hermione's nemesis at Hogwarts is Pansy Parkinson, a bully based on real-life girls who teased the author during her school days. Rowling stated that the character of Hermione carries several autobiographical influences: "I did not set out to make Hermione like me but she is...she is an exaggeration of how I was when I was younger." She recalled being called a "little know-it-all" in her youth. Moreover, she states that not unlike herself, "there is a lot of insecurity and a great fear of failure" beneath Hermione's swottiness. Finally, according to Rowling, next to Albus Dumbledore, Hermione is the perfect expository character; because of her encyclopaedic knowledge, she can always be used as a plot dump to explain the Harry Potter universe. Rowling also states that her feminist conscience is rescued by Hermione, "who's the brightest witch of her age." and is a "very strong female character." Hermione's first name is taken from a character in William Shakespeare's The Winter's Tale, though Rowling has said that the two characters have little to nothing in common otherwise. Rowling said that she wanted her name to be unusual since if fewer girls shared her name, fewer girls would get teased for it and it seemed that "a pair of professional dentists, who liked to prove how clever they are...gave [her] an unusual name that no-one could pronounce." Her original last name was "Puckle", but Rowling felt the name "did not suit her at all", and so the less frivolous Granger made it into the books and movies. Hermione is the brains behind the plan to enter the place where the Stone is hidden. She responds to Harry's wariness of Professor Severus Snape and is also suspicious of him. She reveals to Harry and Ron that she does a lot of research in the library, which helped her defeat the Devil's Snare and work out the logic of the potions. Rowling said on her website that she resisted her editor's requests to remove the troll scene, stating "Hermione is so very arrogant and annoying in the early part of Philosopher's Stone that I really felt it needed something (literally) huge to bring her together with Harry and Ron." Hermione (along with Ron's mother Molly Weasley and a few female students of Hogwarts) develops a liking for Defence Against the Dark Arts teacher Gilderoy Lockhart as he had written all the books required for the subject of Defence Against The Dark Arts in Harry Potter and the Chamber of Secrets. During a morning confrontation between the Gryffindor and Slytherin Quidditch teams, a brawl nearly ensues after Draco Malfoy calls her a "Mudblood", an insulting epithet for Muggle-born wizards when she defends the Gryffindor Quidditch team. She concocts the Polyjuice Potion needed for the trio to disguise themselves as Draco's housemates to collect information about the Heir of Slytherin who has reopened the Chamber of Secrets. However, she is unable to join Harry and Ron in the investigation after the hair plucked from the robes of Slytherin student Millicent Bulstrode (with whom Hermione was previously matched up during Lockhart's ill-fated Duelling Club) was that of her cat, whose appearance she takes on in her human form; it takes several weeks for the effects to completely wear off. Hermione is Petrified by the basilisk after successfully identifying the creature through library research. Though she lies incapacitated in the hospital wing, the information she has found and left behind is crucial to Harry and Ron in their successful mission to solve the mystery of the Chamber of Secrets. Hermione is revived after Harry kills the basilisk, but she is distraught to learn that all end-of-year exams have been cancelled as a school treat. Hermione buys a cat named Crookshanks, who takes to chasing Ron's pet rat, Scabbers. Before the start of term, Professor McGonagall secretly gives Hermione a Time-Turner, a device which enables her to go back in time and handle her heavy class schedule, though this is not revealed until the penultimate chapter. Much tension comes into play between Hermione and her two best friends; Harry is furious with her because she told McGonagall that he had received a Firebolt, which was confiscated to be inspected for traces of dark magic. Ron is angry because he feels Crookshanks is responsible for Scabbers' disappearance, while Hermione fiercely maintains that Crookshanks is innocent. While filling in for Remus Lupin in one Defence Against the Dark Arts class, Snape labels Hermione "an insufferable know-it-all" and penalises Gryffindor after she speaks out of turn in her attempt to describe a werewolf when no one else does. She correctly deduces Lupin's secret after completing Snape's homework assignment from the class, while Crookshanks proves vital in exposing Scabbers as Peter Pettigrew, an erstwhile friend of James and Lily Potter who revealed their whereabouts to Lord Voldemort the night of their murders, and was able to wrongly implicate Sirius Black (revealed to be Harry's godfather) in the Potters' deaths. The Time-Turner enables Hermione and Harry to rescue Sirius and the hippogriff Buckbeak. Hermione is horrified by the cruelty that house-elves suffer, and establishes S.P.E.W., the Society for the Promotion of Elfish Welfare, as an effort to gain basic rights for them. She is Bulgarian Quidditch prodigy Viktor Krum's date at the Yule Ball of the Triwizard Tournament. The proper pronunciation of her name (Her-my-oh-nee) is interjected into the plot when she teaches it to Krum; the best he can do is "Herm-own-ninny," but she has no problem with it. She later gets into a heated argument with Ron after he accuses her of "fraternising with the enemy" in reference to her friendship with Krum. In the book, Hermione's feelings toward Ron are hinted at when she says that Ron can't see her "like a girl," but Krum could. She supports Harry through the Triwizard Tournament, helping him prepare for each task. At the end of the second task, Krum asks her to come see him over the summer in Bulgaria, but she politely refuses. Near the end of the term she stops fraudulent tabloid reporter and unregistered Animagus, Rita Skeeter, who had published defamatory material about Hermione, Harry, and Hagrid during the Triwizard Tournament, by holding her Animagus form (a beetle) captive in a jar. Hermione becomes a Gryffindor prefect along with Ron, and befriends Luna Lovegood, but their friendship gets off to a rocky start after Hermione chastises the publication of Luna's father: "The Quibbler's rubbish, everyone knows that." She also lambasts housemate Lavender Brown for believing the Daily Prophet's allegations of Harry fabricating stories of Voldemort's return. Ron and Hermione spend much of their time bickering, likely due to their growing romantic feelings toward one another, but they show continued loyalty to Harry. Later, new headmistress Professor Umbridge attempts to ban the Quibbler from Hogwarts. This effort becomes moot as the story spreads quickly through the school. One turning point in the series is when Hermione conceives the idea of Harry secretly teaching defensive magic to a small band of students in defiance of the Ministry of Magic's dictum to teach only the subject's basic principles from a textbook, with no hands-on practice. Hermione gets an unexpectedly huge response, and the group becomes the nascent Dumbledore's Army. She is involved in the battle in the Department of Mysteries and seriously injured by a spell from Death Eater Antonin Dolohov, but makes a full recovery. New Potions professor Horace Slughorn invites Hermione to join his "Slug Club", and she helps Ron retain his spot on the Gryffindor Quidditch team when she casts a confund spell on Cormac McLaggen, causing him to miss his last save attempt during Keeper tryouts. Hermione's feelings for Ron continue to grow and she decides to make a move by inviting him to Slughorn's Christmas Party, but he romances Lavender instead in retaliation for his belief that Hermione had kissed Krum years earlier. She attempts to get even by dating McLaggen at the Christmas party, but her plan goes bust and she abandons him midway through the party. Ron and Hermione continually feud with each other (Ron is upset with her because she set birds to attack him after seeing him and Lavender kissing; Hermione is mostly mad because of her growing jealousy) until he suffers a near-fatal poisoning from tainted mead, which frightens her enough to reconcile with him. Following Dumbledore's death, Ron and Hermione both vow to stay by Harry's side regardless of what happens. A minor subplot in the book is that Hermione and Harry form a rivalry in Potions, as Hermione is used to coming first in her subjects and is angered that Harry outperforms her undeservedly by following tips and different instructions written in the margins of Harry's potions book by the previous owner. Hermione is also the only one of the trio to successfully pass her Apparition test (Ron failed, albeit barely, and Harry was too young). In the seventh and final book, Hermione accompanies Harry on his quest to destroy Voldemort's remaining Horcruxes. Before leaving on the quest, she helps ensure the safety of her parents by placing a false memory charm on them, making them think they are Wendell and Monica Wilkins, whose lifetime ambition is to move to Australia. She inherits Dumbledore's personal copy of The Tales of Beedle the Bard, which allows her to decipher some of the secrets of the Deathly Hallows. She prepared for their departure and journey by placing an Undetectable Extension Charm on a small beaded purse so she is able to fill the infinite depths of the bag with materials they will need. Hermione's spell saves her and Harry from Lord Voldemort and his snake Nagini in Godric's Hollow, although the ricochet snaps Harry's wand. When she, Ron, and Harry are captured by Snatchers, who are on the hunt for Muggle-borns under the Ministry's orders, Hermione disguises Harry by temporarily disfiguring his face with a Stinging Jinx. She also attempts to pass herself off as former Hogwarts student Penelope Clearwater and a half-blood to avoid persecution, but is later recognised and taken to Malfoy Manor where Bellatrix Lestrange tortures her with the Cruciatus Curse in an attempt to extract information on how Hermione, Harry, and Ron came to possess Godric Gryffindor's sword (which was supposed to be safe in the Lestrange vault at Gringotts). Bellatrix orders for Griphook the goblin to inspect the sword and tell whether it is fake or real. In order to save Hermione, Harry runs to Griphook in the cellar where they are all imprisoned, and convinces him to lie to Bellatrix that the sword is a fake. When the others are able to escape their cell, Bellatrix threatens to slit Hermione's throat. Hermione, Harry, Ron and the other prisoners being held in Malfoy Manor are eventually rescued by Dobby. Hermione later uses Polyjuice Potion to impersonate Bellatrix when the trio attempt to steal Hufflepuff's cup from Gringotts. She, Harry, and Ron join Dumbledore's Army in the Battle of Hogwarts, during which Hermione destroys Hufflepuff's cup in the Chamber of Secrets with a basilisk fang, eliminating another Horcrux. Hermione and Ron also share their first kiss in the midst of the battle. In the final battle in the Great Hall, Hermione fights Bellatrix with the help of Ginny Weasley and Luna. However, the three of them are unable to defeat Bellatrix and stop fighting her once Molly Weasley orders them to disengage. Nineteen years after Voldemort's death, Hermione and Ron have two children, Rose and Hugo. Though the epilogue does not explicitly say Hermione and Ron are married, news articles and other sources treat it as a fact. The two children are not Weasleys as she instead names them Rose Granger-Weasley and Hugo Granger-Weasley. In the books, Hermione is described as having bushy brown hair and brown eyes. Her front buck teeth, already very large, grow uncontrollably in Goblet of Fire after she is affected by a spell cast by Draco Malfoy. Madam Pomfrey attends to her in the hospital wing and, at her request, shrinks the teeth down to a normal size that matches her mouth. In the movies however, her hair seems to become a lot less bushy and always has regular teeth. Hermione's most prominent features include her prodigious intellect and cleverness. She is levelheaded, book-smart, and always very logical. Throughout the series, Hermione uses the skills of a librarian and teacher to gather the information necessary to defeat Voldemort, the "Dark Lord". When in doubt, it is to the school library that Hermione always turns to. She is often bossy yet unfailingly dutiful and loyal to her friends—a person who can always be counted on. J.K. Rowling stated that Hermione is a person that, "never strays off the path; she always keeps her attention focused on the job that must be done." Despite Hermione's intelligence and bossy attitude, Rowling says that Hermione has "quite a lot of vulnerability in her personality," as well as a "sense of insecurity underneath," feels, "utterly inadequate... and to compensate, she tries and strives to be the best at everything at school, projecting a confidence that irritates people." During her Defence against the Dark Arts exam at the end of Harry Potter and the Prisoner of Azkaban, Hermione reveals that her biggest fear is failure, after a Boggart takes the form of Professor McGonagall and tells her that she has failed all her exams. Hermione is extremely compassionate and is very quick to help others, especially those who are defenceless, such as Neville Longbottom, first-years, House-Elves, fellow Muggle-borns, half-giants like Hagrid, and werewolves like Lupin. It was revealed by J.K. Rowling after the publication of the final book that Hermione's career in the Ministry was to fight for the rights of the oppressed and disenfranchised (such as House-elves or Muggle-borns). Hermione is also very protective of her friends and values them so much that Rowling has suggested that, if Hermione had looked in the Mirror of Erised, she would have seen Harry, Ron, and herself "alive and unscathed, and Voldemort finished." Hermione has also learned to ignore what bullies such as Draco Malfoy say to her, often preventing Harry and Ron from retaliating and thinking of some way to outsmart him. She accepts her status as a Muggle-born witch, and states in Deathly Hallows that she is "a Mudblood and proud of it". Hermione is portrayed during the whole series as an exceptionally talented young witch. J.K. Rowling has stated that Hermione is a "borderline genius." She received ten O.W.L.s, which were nine Outstandings and one Exceeds Expectations. She is the best student in Harry's year and is repeatedly the first student to master any spell or charm introduced in her classes and even from more advanced years, as evidenced when she is able to conjure a Protean Charm on the D.A. 's fake Galleon coins, which is actually a N.E.W.T. level charm. She is also the first one of her age to be able to cast non-verbal spells. Hermione is a competent duellist - Rowling has stated that while during the first three books Hermione could have beaten Harry in any magical duel, but by the fourth book Harry had become so good at Defence Against the Dark Arts that he would have defeated Hermione. Hermione did not tend to do as well in subjects that were not learned through books or formal training, as broom flying did not come as naturally to her in her first year as it did to Harry, and she showed no affinity for Divination, which she dropped from her third year studies. She was also not good at Wizard's Chess, as it was the only thing at which she ever lost to Ron. Hermione's Patronus is an otter, Rowling's favourite animal. In the Deathly Hallows book, while they enter the Ministry Of Magic under disguise, Hermione impersonates Mafalda Hopkirk. It is also stated that conjuring a Patronus is the only thing she ever has trouble with. Her wand is made of vine wood and dragon heartstring core; vine is the wood ascribed to Hermione's fictional birth month (September) on the Celtic calendar. Hermione is viewed by many as a feminist icon. In The Ivory Tower and Harry Potter, the first book-length analysis of the Harry Potter series (edited and compiled by Lana A. Whited), a chapter titled "Hermione Granger and the Heritage of Gender," by Eliza T. Dresang, discusses Hermione's role in the series and its relation to feminist debates. The chapter begins with an analysis of Hermione's name and the role of previous characters with the same name in mythology and fiction, and the heritage Hermione has inherited from these characters due to her name. Dresang also emphasises Hermione's parallelism with Rowling herself and how, as Hermione has some attributes from Rowling herself, she must be a strong character. The chapter also points out the fact that, despite being born to Muggle parents, Hermione's magical abilities are innate. 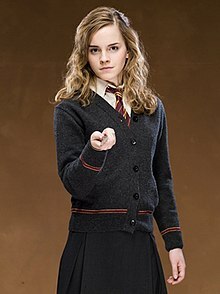 Her "compulsion for study" helps both the character's development, which makes Hermione "a prime example that information brings power", and the plot of the series, as her knowledge of the wizarding world is often used to "save the day". Dresang states that "Harry and Ron are more dependent on Hermione than she is on them." However, she also remarks that Hermione's "hysteria and crying happen far too often to be considered a believable part of the development of Hermione's character and are quite out of line with her core role in the book." UGO Networks listed Hermione as one of their best heroes of all time, saying, "Most of us can probably recall having a classmate like Hermione when we were in grammar school"—one who "can at first be a little off-putting, but once you get to know her, she's not a bad chick to have on your side". IGN also listed Hermione as their second top Harry Potter character, praising her character development. In 2016 The Hollywood Reporter conducted a poll of Hollywood professionals, including actors, writers and directors, into their favourite female characters of all time, with Hermione topping the poll. Philip Nel of Kansas State University notes that "Rowling, who worked for Amnesty International, evokes her social activism through Hermione's passion for oppressed elves and the formation of her 'Society for the Promotion of Elfish Welfare'". However, in an analysis for Harry Potter and the Deathly Hallows, Rowland Manthrope states that "seven books on, we still only know her as swottish, sensible Hermione—a caricature, not a character." Emma Watson portrayed Hermione in all eight Harry Potter films. Watson's Oxford theatre teacher passed her name on to the casting agents of Philosopher's Stone, impressed with her school play performances. Though Watson took her audition seriously, she "never really thought she had any chance" of getting the part. The producers were impressed by Watson's self-confidence and she outperformed the thousands of other girls who had applied. Rowling herself was supportive of Watson after her first screen test. When asked if she thought actors suited the characters, Rowling said, "Yes, I did. Emma Watson in particular was very, very like Hermione when I first spoke to her, I knew she was perfect from that first phone call." Watson was well-received for the first film; IGN even commented that "from Hermione Granger's perfect introduction to her final scene, Watson is better than I could have possibly imagined. She steals the show." IGN also wrote that her "astute portrayal of Hermione has already become a favorite among fans." Before the production of Half-Blood Prince, Watson considered not returning, but eventually decided that "the pluses outweighed the minuses" and that she could not bear to see anyone else play Hermione. Watson has said that Hermione is a character who makes "brain not beauty cool," and that though Hermione is "slightly socially inept," she is "not ashamed of herself." When filming Chamber of Secrets, Watson was "adamant" that she wasn't like Hermione, but she reflects that "as I got older, I realised she was the greatest role model a girl could have." In 2007, before the release of Order of the Phoenix, Watson said, "There are too many stupid girls in the media. Hermione's not scared to be clever. I think sometimes really smart girls dumb themselves down a bit, and that's bad. When I was nine or ten, I would get really upset when they tried to make me look geeky, but now I absolutely love it. I find it's so much pressure to be beautiful. Hermione doesn't care what she looks like. She's a complete tomboy." Screenwriter Steve Kloves revealed in a 2003 interview that Hermione was his favourite character. "There's something about her fierce intellect coupled with a complete lack of understanding of how she affects people sometimes that I just find charming and irresistible to write." In Harry Potter and the Cursed Child, Hermione Granger is played by the South African-born actress Noma Dumezweni, also known for her work in Linda, A Raisin in the Sun and A Human Being Died That Night. Dumezweni described the role as a "privilege and a responsibility" and said that "we all aspire to be Hermione." The choice of a black actress to play the part led to criticism on social media, which J.K. Rowling described as being by "a bunch of racists", adding that the books never explicitly mentioned her race or skin colour, and that she has been portrayed as black in fan art. Emma Watson also expressed her support for the actress, tweeting that she looked forward to seeing her in the role. Dumezweni herself called the backlash "so unimaginative", stating that "So many young actors and actresses have told me that they’re so pleased I’m playing Hermione because they can see a version of themselves on the stage." Dumezweni received praise for her performance; The Independent commented that she "did a tremendous job as the stern witch." At the 2017 Laurence Olivier Awards, Dumezweni received the Award for Best Actress in a Supporting Role for her portrayal of Hermione. Hermione has been parodied in numerous sketches and animated series. On Saturday Night Live, Hermione was played by Lindsay Lohan. On his show Big Impression, Alistair McGowan did a sketch called "Louis Potter and the Philosopher's Scone". It featured impressions of Nigella Lawson as Hermione. In 2003, Comic Relief performed a spoof story called Harry Potter and the Secret Chamberpot of Azerbaijan, in which Miranda Richardson, who plays Rita Skeeter in the Harry Potter films, featured as Hermione. Hermione also features in the Harry Bladder sketches in All That, in which she appears as Herheiny and is portrayed by Lisa Foiles. The Wedge, an Australian sketch comedy, parodies Hermione and Harry in love on a "Cooking With..." show before being caught by Snape. Hermione also appears as Hermione Ranger in Harry Podder: Dude Where's My Wand?, a play by Desert Star Theater in Utah, written by sisters Laura J., Amy K. and Anna M. Lewis. In the 2008 American comedy film Yes Man, Allison (played by Zooey Deschanel) accompanies Carl (Jim Carrey) to a Harry Potter-themed party dressed as Hermione. In Harry Cover, a French comic book parody of the Harry Potter series by Pierre Veys (subsequently translated into Spanish and English), Hermione appears as Harry Cover's friend Hormone. Hermione also appears in The Potter Puppet Pals sketches by Neil Cicierega, and in the A Very Potter Musical, A Very Potter Sequel, and A Very Potter Senior Year musicals by StarKid Productions played by Bonnie Gruesen in the first two and Meredith Stepien in the third. Hermione is the focus of the fan-created web-series, Hermione Granger and the Quarter Life Crisis. ^ The scene in which Hermione solves the puzzle during the entrance to the Philosopher's Stone was not included in the movie. Rowling, J. K. (1997). Harry Potter and the Philosopher's Stone. London: Bloomsbury/New York City: Scholastic, et al. UK ISBN 0-7475-3269-9/U.S. ISBN 0-590-35340-3. Rowling, J. K. (1998). Harry Potter and the Chamber of Secrets. London: Bloomsbury/New York City: Scholastic, et al. UK ISBN 0-7475-3849-2/U.S. ISBN 0-439-06486-4. Rowling, J. K. (1999). Harry Potter and the Prisoner of Azkaban. London: Bloomsbury/New York City: Scholastic, et al. UK ISBN 0-7475-4215-5/U.S. ISBN 0-439-13635-0. Rowling, J. K. (2000). Harry Potter and the Goblet of Fire. London: Bloomsbury/New York City: Scholastic, et al. UK ISBN 0-7475-4624-X/U.S. ISBN 0-439-13959-7. Rowling, J. K. (2003). Harry Potter and the Order of the Phoenix. London: Bloomsbury/New York City: Scholastic, et al. UK ISBN 0-7475-5100-6/U.S. ISBN 0-439-35806-X. Rowling, J. K. (2005). Harry Potter and the Half-Blood Prince. London: Bloomsbury/New York City: Scholastic, et al. UK ISBN 0-7475-8108-8/U.S. ISBN 0-439-78454-9. Rowling, J. K. (2007). Harry Potter and the Deathly Hallows. London: Bloomsbury/New York City: Scholastic, et al. UK ISBN 1-55192-976-7/U.S. ISBN 0-545-01022-5. ^ a b c d e f Rowling, J.K. "Section:Extra Stuff — Hermione Granger". J.K. Rowling Official Site. Archived from the original on 16 September 2008. Retrieved 19 September 2008. ^ a b THR Staff (9 December 2016). "Hollywood's 50 Favorite Female Characters". "The Hollywood Reporter". Retrieved 30 November 2017. ^ "Hermione Jean Granger". Retrieved 7 December 2014. ^ Rowling, J.K. "F.A.Q. : When Hermione arrived at Hogwarts, was she nearly eleven or nearly twelve?". J.K. Rowling Official Site. Archived from the original on 8 February 2012. Retrieved 9 February 2011. ^ a b "J.K. Rowling at the Edinburgh Book Festival". Accio-quote.org. 15 August 2004. Retrieved 23 April 2007. ^ a b c "J.K. Rowling's World Book Day Chat". Accio-quote.org. 4 March 2004. Retrieved 23 April 2007. ^ "J K Rowling at the Edinburgh Book Festival". Accio-quote.org. 15 August 2004. Retrieved 5 September 2007. ^ Fry, Stephen (26 June 2003). "J.K. Rowling at the Royal Albert Hall". Accio-quote.org. Retrieved 14 August 2007. ^ a b Mzimba, Lizo (February 2003). "Chamber of Secrets DVD: Interview with Steve Kloves and J.K. Rowling". Accio-quote.org. Retrieved 1 January 2011. ^ "J.K. Rowling's Books That Made a Difference". O, The Oprah Magazine. January 2001. Retrieved 1 January 2011. My feminist conscience is saved by Hermione, who's the brightest character. I love Hermione as a character. ^ a b "Transcript of National Press Club author's luncheon". NPR Radio on Accio Quote!. 20 October 1999. Retrieved 23 April 2007. ^ Rowling, J.K. (1999). "JKR quotes about Names and Naming: Accio Quote! The Largest Archive of J.K. Rowling Quotes on the Web". Accio-quote.org. Retrieved 10 October 2010. ^ Rowling 1997, p. 127-171. ^ Rowling 1997, p. 132-180. ^ Rowling 1997, p. 202-278. ^ Rowling 1998, p. 48-59. ^ Rowling 1998, p. 249-340. ^ Rowling 1999, p. 62-78. ^ a b Rowling 1999, p. 231-317. ^ a b Rowling 1999, p. 314-435. ^ Rowling 2000, p. 360-414. ^ Rowling 2000, p. 631-727. ^ Rowling 2003, p. 698-792. ^ Rowling 2003, p. 754-856. ^ Rowling 2005, p. 220-233. ^ Rowling 2005, p. 317. ^ Rowling 2005, p. 318. ^ Rowling 2005, p. 607-651. ^ Rowling 2007, p. 502-625. ^ Rowling 2007, p. 589-736. ^ a b Rowling 2007, p. 604-755. ^ Brown, Jen (26 July 2007). "Finished 'Potter'? Rowling tells what happens next". Today. Retrieved 8 January 2015. ^ Toler, Lindsay (5 August 2007). "'Harry Potter' author ties up loose ends". The Arizona Republic. London. Associated Press. Archived from the original on 12 January 2015. Retrieved 8 January 2015. ^ "Hermione Jean Granger". The Harry Potter Lexicon. Retrieved 8 January 2015. ^ Freier, Mary P. (1 January 2014). "The Librarian in Rowling's Harry Potter Series". CLCWeb: Comparative Literature and Culture. 16 (3). doi:10.7771/1481-4374.2197. ISSN 1481-4374. ^ "New Interview with J.K. Rowling for Release of Dutch Edition of "Deathly Hallows"". The Volkskrant, translated on The Leaky Cauldron. 19 November 2007. Retrieved 5 December 2010. ^ "A Good Scare". Time. 30 October 2000. Archived from the original on 28 February 2010. Retrieved 5 December 2010. ^ "Harry Potter and Me(BBC Christmas Special)". BBC, transcript on Accio Quote!. 28 December 2001. Retrieved 14 August 2007. ^ "An Evening with Harry, Carrie and Garp: Readings and questions #1". Accio-quote.org. 1 August 2006. Retrieved 1 January 2011. ^ "J.K. Rowling interview". The Connection (WBUR Radio), transcript on Accio Quote!. 12 October 1999. Retrieved 1 January 2011. ^ Rowling 2003, p. 353-398. ^ "World Exclusive Interview with J K Rowling". South West News Service, transcript on Accio Quote!. 8 July 2000. Retrieved 15 August 2007. ^ Rowling 1997, p. 108. ^ Rowling 1999, p. 298. ^ Rowling 1999, p. 299. ^ Rowling 1997, p. 159. ^ "America Online chat transcript". AOL.com on Accio Quote!. 19 October 2000. Retrieved 14 August 2007. ^ "Section: Extra Stuff WANDS". J.K. Rowling Official Site. Archived from the original on 6 August 2011. Retrieved 2 July 2007. ^ "Danaerys Targaryen: Feminism for the Iron Throne". Hbowatch.com. 29 May 2013. Retrieved 29 May 2014. ^ a b Dresang, Eliza T. (2004). "Hermione Granger and the Heritage of Gender". The Ivory Tower and Harry Potter. University of Missouri Press. ISBN 978-0-8262-1549-9. ^ Donahue, Deidre (16 November 2001). "'Potter' inspires academic analysis". USA Today. Retrieved 1 January 2011. ^ Manthrope, Rowland (29 July 2007). "A farewell to charms". The Observer. Retrieved 10 February 2011. ^ "When Danny met Harry". The Times. UK. 3 November 2001. ^ Kulkani, Dhananjay (23 June 2004). "Emma Watson, New Teenage Sensation!!". Buzzle. Archived from the original on 29 June 2012. Retrieved 3 August 2007. ^ Linder, Brian (16 November 2001). "Brian Linder's Review of Harry Potter and the Sorcerer's Stone". IGN. Retrieved 16 October 2010. ^ Steve Head; Brian Linder (16 November 2001). "Harry Potter and the Sorcerer's Stone Video Interviews". Retrieved 16 October 2010. ^ "Hermione Gets Cold Feet". IGN. 26 September 2006. Archived from the original on 15 December 2007. Retrieved 20 October 2007. ^ a b Listfield, Emily (8 July 2007). "We're all so grown up!". Parade. Retrieved 3 August 2007. ^ "Emma Watson's speech at Oxford Union, Oxford University". 12 November 2006. Retrieved 1 January 2011. ^ "Chamber of Secrets". Emma Watson Official Site. Archived from the original on 5 November 2010. Retrieved 31 October 2010. ^ Tan, Monica (21 December 2015). "Noma Dumezweni cast as Hermione in new Harry Potter stage play". TheGuardian.Com. ^ Trueman, Matt (26 February 2016). "Noma Dumezweni on playing Hermione in Harry Potter: 'we all aspire to be her'". The Guardian. Retrieved 15 May 2017. ^ Rebecca Ratcliffe (5 June 2016). "JK Rowling tells of anger at attacks on casting of black Hermione". The Guardian. Retrieved 16 November 2016. Author says Noma Dumezweni is ‘best for the job’ in West End play Harry Potter and the Cursed Child ... JK Rowling has revealed her frustration at online reaction by “a bunch of racists” to news that the role of Hermione will be played by a black actress in the eagerly awaited new play Harry Potter and the Cursed Child. ... Rowling has pointed out that there is no reason why Hermione should be white. The books don’t explicitly mention her race or skin colour, and she is often portrayed as black in fan art. ^ Shepherd, Jack (3 January 2016). "Harry Potter and the Cursed Child: Emma Watson responds to Noma Dumezweni's casting as Hermione". The Independent. Retrieved 15 May 2017. ^ "Black actress Noma Dumezweni reacts to Hermione Granger casting". BBC Newsbeat. 12 January 2016. Retrieved 15 May 2017. ^ a b Furness, Hannah (9 April 2017). "Harry Potter and the Cursed Child casts its spell over the Oliviers with a record-breaking nine awards". The Telegraph. Retrieved 15 May 2017. ^ Shepherd, Jack (25 July 2016). "Harry Potter and the Cursed Child, review: A magical experience tailor made for the stage". The Independent. Retrieved 15 May 2017. ^ "Saturday Night Live Transcripts". Retrieved 27 July 2007. ^ "BBC One press release" (PDF). 2001. Retrieved 20 May 2007. ^ "Australian television: The Wedge episode guide". Retrieved 25 May 2007. ^ "'Harry Podder' to open on stage". HighBeam Research. 5 June 2005. Archived from the original on 5 May 2016. ^ "Harry Cover". Bédéthèque. Retrieved 8 June 2007.